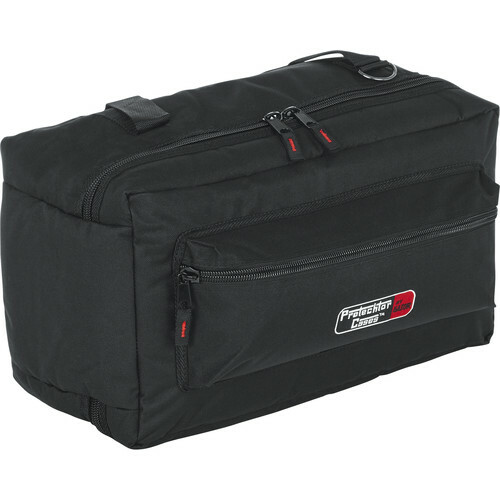 The Gator GP-66 Carrying Bag (Black) is a 600 denier nylon bag with 30mm spongy foam and synthetic fur lining. It is designed for multple uses including carrying Par Can lights and accessories but can also be used to carry double bass drum pedals or a set of Bongo drums. This bag will fit a 5" or 6" Cassegrain telescope tube with it's mount for transport to areas without light pollution. There is a large zippered front pocket. The bag is carried by carrying handles and a removable shoulder strap. Box Dimensions (LxWxH) 16.0 x 14.5 x 2.0"
GP-66 Carrying Bag is rated 4.7 out of 5 by 6. Rated 4 out of 5 by John K. from well constructed, good padding I use this bag to carry studio monolights for photo shoots. I'm able to pack 2 lights and cords/small accessories, or 3 lights without accessories (carried in another bag). The padding is excellent and the bag is solid. My only minor complaint is that the carrying handles don't come quite close enough to each other, so it's a little awkward to pick it up like a suitcase - the handles are constantly pulling outward. Wish there were velcro to hold them together. Otherwise, it's great! Rated 5 out of 5 by RockStarHDStudios from Great Double Kick Bag!!! My double kick fits perfect in this bag. I own a DW3000 and I dont have to break it down. Its great for easy tear down at the end of a gig... Great Bag! Rated 5 out of 5 by Anonymous from Great Bag! I use this bag to carry cables and pedals for my keyboard rig. It has great padding to keep the items from getting messed up in transit. As well, it is easy on my vehicles interior. I like the way the top opens completely making easy access and viewing to everything in it. The only thing I would suggest is to make the sides a bit more stiff. Other than that, this is a great bag. Rated 4 out of 5 by BColgate from Handy Case Keeps Your Stuff Together We needed a simple bag to store an Arri 1K with barn doors, scrims & such, because I like everything in containers - no loose stuff flopping about. This inexpensive bag was fine, though it does not offer a lot of protection beyond minor dings and nicks. Not a lot of structure to it either, but it does the job. Rated 5 out of 5 by dustysandy from Excellent Little Case I planned to use this for one or two Strobe Lights. I ended up getting two of the roomier Photogenic 2-Light Cases that come with wheels and have room for a smallish light stand. Still, all-in-all, if you have need for a small padded case you cannot beat this price. Rated 5 out of 5 by JohnDC from Nice Case Well padded and a bit larger than the specs indicate.